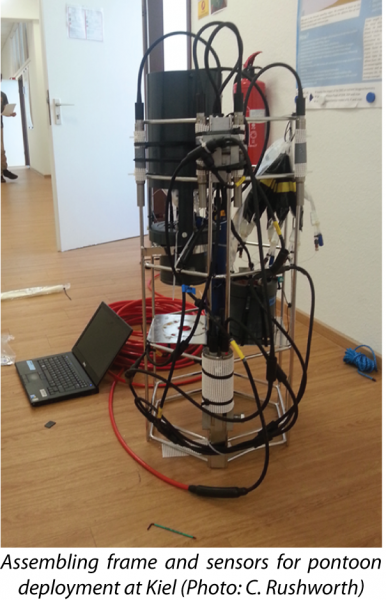 In September, the SenseOCEAN project came together for 10 days at GEOMAR in Kiel, Germany to have a joint testing and calibration session. 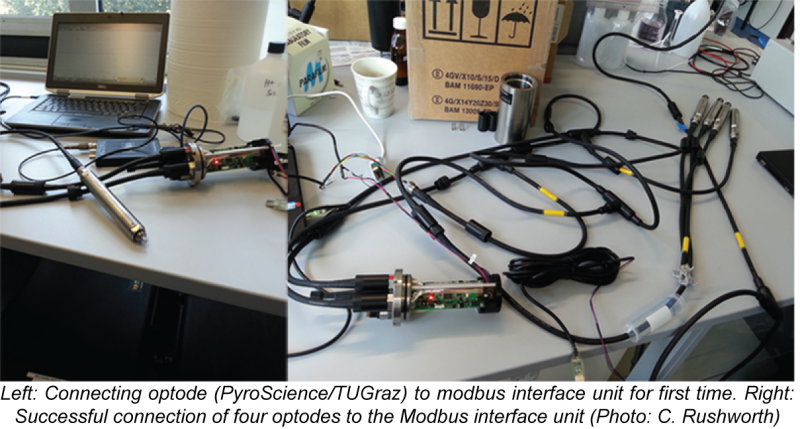 The aims were to test the individual sensor’s performance against each other (as well as calibrating against laboratory based measurements) and to test the integration of the sensors with the Modbus1 interface unit. 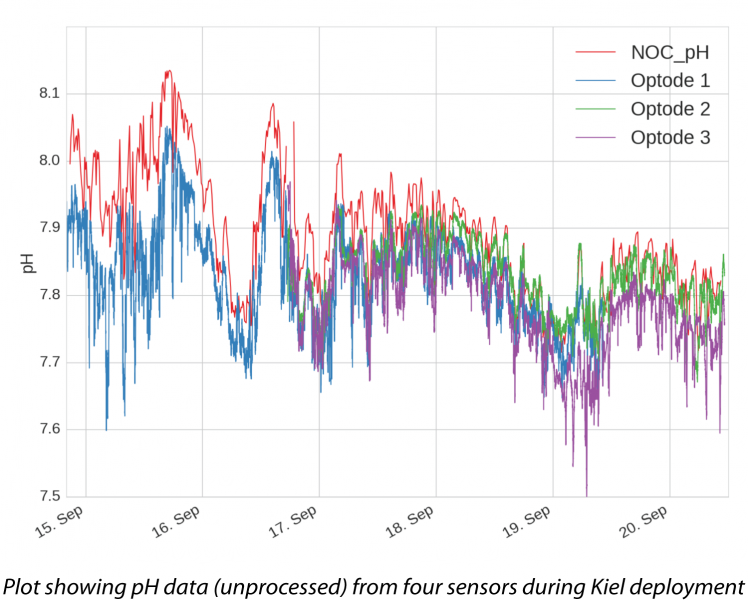 A range of sensors (electrochemical, optode and lab on chip) measuring several parameters (pH, nitrate, nitrite, silicate, phosphate, Fe(II), Fe (III) CO2, O2, Na (salinity), ammonia and N2O) were taken to Kiel. Testing took place dockside from a pontoon and also in deeper water at Boknis Eck from the FK Littorina, one of GEOMAR’s research vessels. Sensors were successfully connected to the Modbus and deployed as an integrated unit. Data was logged successfully via the Modbus by all the sensors over periods of several days. Each sensor clearly showed measurements that were consistent with the known water column characteristics. In addition, preliminary unprocessed data for several parameters measured by different sensor types showed good correlation. An example of the pH data measured by lab on chip and optode sensors is shown below. 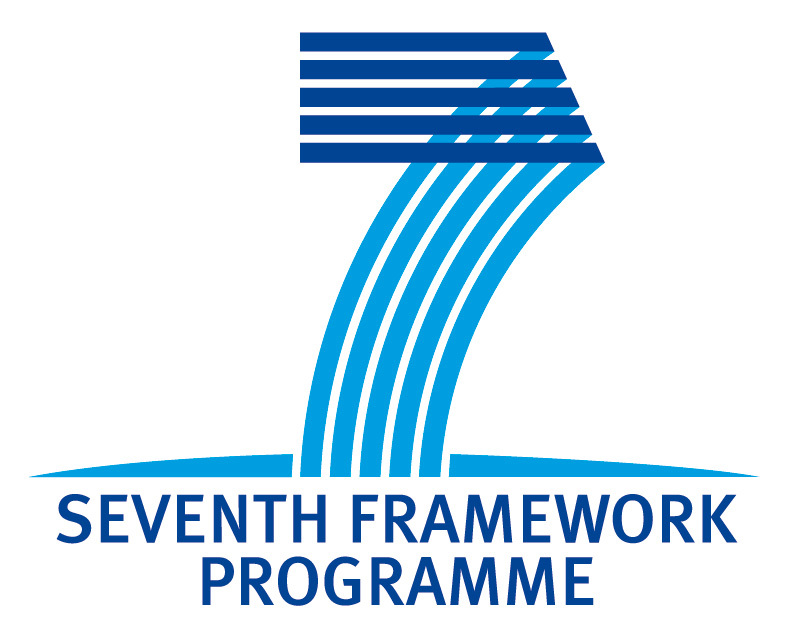 Further testing of the Modbus interface unit and sensors will take place in Southampton Dock in December. The integrated sensor system will then be deployed for more rigorous testing on several types of platform (e.g. moorings, Provor floats, landers) in a variety of locations in 2017 (e.g. offshore Chile, Baltic Sea). 1 Modbus is a method used for transmitting information over serial lines between electronic devices.